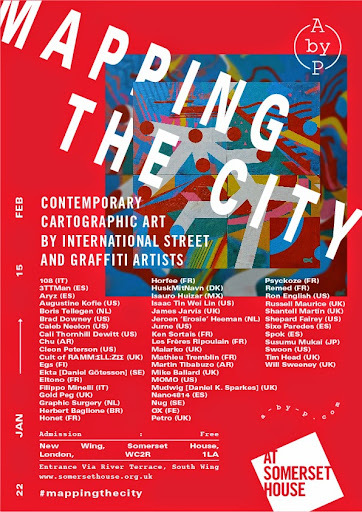 Opening this Thursday (22nd January) Mapping The City at Somerset House, London is a huge show, packed with cartographic artworks of all sizes and dimensions. Featuring an amazing lineup of global (street) art stars and compadres of Alakazam, including Horfee, Russell Maurice, Nano 4814, 3TTMAN, Ron English, Cali Dewitt, Tim Head, James Jarvis, Susumu Mukai, Will Sweeney and many more. Not to be missed!